Yauri Muenala, cultural activator of Yachay Tech, presented his work of art at the John David Mooney Foundation in the city. 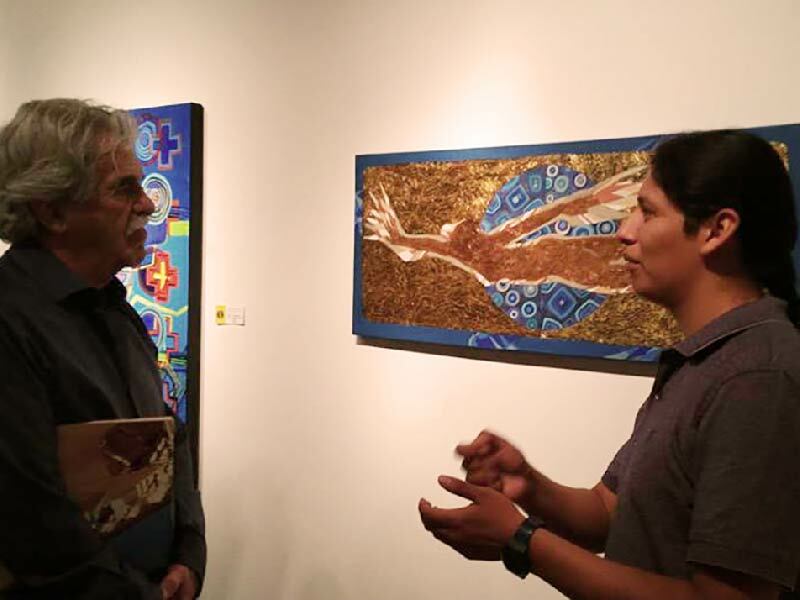 Yauri Muenala, cultural activator of Yachay Tech University, and his brother Inty, presented their work of art “Amawtay Pacha” (Time-Space of Andean Wisdom) on June 6, 2018, at the International Currents Gallery of the John David Mooney Foundation in Chicago, USA. The exhibit covered different aspects related to cultural and artistic practices of the Kichwa-Otavalo people. Yauri is an artist, audiovisual communicator and has a Master’s Degree in Visual Anthropology from the Latin American Faculty of Social Sciences (FLACSO), in Ecuador. The Muenala brothers have already had several experiences with international exhibitions. In 2010 they held their first, after being invited by the “Flynndog” Foundation in Burlington, Vermont, in North USA. In 2013 they presented “Sinchi Supay Churo” (The Spiral of Spiritual Force) in France. Then in 2015 the Ecuadorian Consulate in Genoa, Italy, included their work at the Museum of World Cultures, as part of a permanent exhibition. This time, Yauri’s work parts from a research line of the artistic practices of the Kichwa-Otavalo culture. His brother, on the other hand, has been working on topics related to immigration, inter-culturality, and exploration of Andean geometry as an element in the transmission of meanings. Both works display the idea of ​​the continuance of the practices, traditions and symbols of their people that begins to take the reins from their own artistic representations. In this way, a museographic montage was built. Through painting, Yauri pays tribute to the audiovisual practices of the Kichwa-Otavalo people, whose work was the grounds of an academic research. He says that since the 90s the audiovisual material related to his people was mainly documentary, often from an external view. However, during his research work, Yauri worked together with a group of filmmakers who began to explore topics that had not been traditionally covered, such as the use of poetry and narrative in audiovisual creations. These filmmakers re-created and imagined possible realities and began to explore with reflective and cultural elements within the genre of fiction. Yauri approaches his reflections from the academic debates in the field of visual anthropology. Thus, through his painting exhibition, Yauri projected his categories of analysis; self-representation, imagination and re-appropriation process of fundamental elements such as ritual and language. In turn, this exhibition is anchored to the publication of a book that will be released in August of this year. The idea of this is to extend research to different spaces, to highlight the main aspects and the sociocultural changes that these artistic practices represent in the Kichwa-Otavalo people; from the respect to the own culture at the time of the audiovisual production, to the fact of representing their culture from a personal perspective.